Controlling the clock with its running game and playing rigid defense, the Wood River High School football team won its first road and league game of the 2010 season Friday by a 27-20 score at Burley. The impressive team effort put the Wolverines in position to earn Hailey's first .500 grid season since 2000 when Wood River hosts Canyon Ridge of Twin Falls Friday, Oct. 22 at 7 p.m. on "Senior Night." Second-year Wood River coach Kevin Stilling said his team played four quarters of solid, fumble-free football in snapping a three-game losing skid and stretching Burley's two-season losing streak to 11. Wood River (3-4, 1-3 league) out-rushed the Bobcats 227-56 in the Great Basin Conference game and dominated the first half on offense and defense while building a 20-6 halftime lead over Burley (0-7, 0-4). In the first 19 minutes, Wood River had an 8-0 edge in first downs and 38-11 edge in offensive plays. On Burley's Homecoming Night the visitors controlled the ball for 15 minutes and Burley had the ball for just four of those first 19 minutes. Another sign of the Wolverine ball control success was in the rushing game: Wood River had 30 carries for 154 yards and Burley six carries for eight yards in the first 19 minutes. Stilling said, "A huge concern for our defense was stopping the Burley power running game, but we were able to do that successfully." 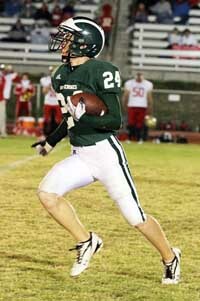 Burley's runners averaged 1.6 yards and were held to one yard or fewer on 21 of their 35 carries. Seniors Tanner Farrow and Nathan Farrow scored 11-yard and 10-yard running touchdowns, and junior quarterback Connor Braatz made the score 20-0 on a 24-yard touchdown pass to senior Alex Padilla. During the game Braatz handed it to four different ball carriers who each piled up 40 yards or more rushing topped by Greg Lindbloom (17 carries for 63 yards), Tanner Farrow (8-for-56), Trace Tupper (10-for-52) and Nathan Farrow (6-for-41). Padilla's second touchdown of the game and his team-leading seventh of the season came on a 49-yard interception return with two minutes left in the fourth quarter, giving Wood River a 27-6 lead. It was Wood River's first defensive score all season. And it came at just the right time. Thanks to several questionable penalties—officials whistled Wood River for 90 penalty yards in the second half to none for Burley—the Bobcats tallied two TDs in the final two minutes to make the score closer. In reality, the final score could have favored Wood River by 30 or more points instead of just seven, such was the Wolverine dominance Friday. Stilling said, "We had a few more opportunities we would have liked to cash in during the first and second halves." Wood River nearly scored on its first possession, Lindbloom running seven times for 25 tough yards during a 14-play, six-minute drive that stalled on a illegal block penalty after reaching the 'Cats 17-yard-line. After Burley went four-and-out, Wood River moved quickly 60 yards in six plays for its first score. Tupper contributed the big gainer, a 15-yard right end run on a pitch behind a Braxton Parish crackback block. Tanner Farrow scored his third touchdown of the season on a strong 11-yard run. Doing excellent blocking was the offensive line of center John Siegel, guards Ben Williams and Jake Vegwert, and tackles Kevin Cooley and Isaiah Garza. Burley (4 turnovers) coughed up the ball on its next possession. Given great field possession, Wood River punched it across as Nathan Farrow powered off tackle for 10 yards. Placekicker Haylee Thompson made all three of her extra-point kicks. Wood River made it 20-0 midway through the second. Nathan Farrow ran three times for 17 yards on a five-play, 51-yard drive capped by a 24-yard TD pass from Braatz to Padilla behind the Bobcats defense. A pass interference penalty whistled against Wood River on a third-and-seven Jake Mills pass with a minute remaining led to Burley's only first-half score. Thereafter the Wolverine defense led by Tanner Farrow (19 tackles) and Kasey Barker (8) stifled Burley until the very end of the game. In the second half, two untimely holding penalties in the Red Zone prevented Wood River TDs and Thompson missed 40-yard and 35-yard field goal tries. But the running game ate up a lot of clock—eight minutes deep into the fourth on a 14-play drive. Excellent defensive penetration by players like Lindbloom, KJ Savaria, Barker, Vegwert and Drew Barsch forced Burley's strong-throwing senior quarterback Mills (7-for-18, 92 yards) to throw long on a third-and-15 situation. Padilla intercepted at midfield and finished a 49-yard run for a 27-6 lead. The rest was garbage time, as Mills kept putting the ball up and the officials kept tossing their flags. "Aw, why don't you just give them the touchdown," one frustrated Wood River fan hollered after one mystifying pass interference infraction. "Senior Night" and "Pink Out"
Wood River's "Senior Night" home finale is Friday, Oct. 22 at 7 p.m. at Hailey's Phil Homer Field against the Canyon Ridge Riverhawks (2-5, 1-3). A victory would give the Wolverines fourth place in the Great Basin. Neither team is playoff-bound, but Stilling and the Hailey coaching staff is well aware the Riverhawks have improved over their inaugural season of 2009. Canyon Ridge was 1-7 last year and dropped its home finale 9-8 to Wood River, but the 'Hawks have increased their scoring average from 11.4 to 19.4, and reduced their defensive liabilities from 40.0 to 29.0. Canyon Ridge won at Filer 27-12 Sept. 3 and beat Burley at home 21-14 Oct. 1, but the 'Hawks have dropped two straight, 40-19 at home to Buhl and 51-27 Friday at Minico. Besides being a special occasion for the 16 seniors and their parents and families, Friday is "Pink Out" at the Hailey field. The Wood River Student Union is hosting "Pink Out" activities to raise money for breast cancer research. "We are hoping to get a lot of community support," said Student Union advisor Stephanie Spindler. Activities include a "Pink Out" powder puff scrimmage at halftime of the game, a Cheer for the Cure from the cheerleaders and a performance by the Drum Line. Football players will wear pink as well. T-shirts priced at $10 will be sold. Rushing—Greg Lindbloom 17-63, 4 1sts; Tanner Farrow 8-56, 1 1st, 1 TD; Trace Tupper 10-52, 3 1sts; Nathan Farrow 6-41, 2 1sts, 1 TD; Braxton Parish 7-13, 1 1st; Alex Padilla 1-2; Connor Braatz 5-0. Passing—Connor Braatz 1-6, 24 yards, 1 TD, 1 interception. Receiving—Alex Padilla 1-24, 1 TD. Fumble recoveries (3)—Drew Barsch 1, Greg Lindbloom 1, Braxton Parish 1. Interceptions (1)—Alex Padilla 1 with a 49-yard TD return. Tackles (50)—Tanner Farrow 10, Kasey Barker 8, Greg Lindbloom 6, Alex Padilla 4, KJ Savaria 4, Drew Barsch 4, Nathan Farrow 3, Kevin Cooley 2, Trace Tupper 2, Ben Williams 1, Willy Dugger 1, Alex Thomas 1, Braxton Parish 1, John Siegel 1, Tyler Bartlett 1, Jake Vegwert 1. Rushing leaders—Branson Handy 7-32, 2 1sts; Alex Carrasco 15-14, 2 1sts, 1 TD; Jason Rebollozo 6-15, 1 1st, 1 conv. ; Jason Konrad 1-2; Jake Mills 2-0; Drew Bailey 3, -4; Juan Labra 1, -3. Passing—Jake Mills 7-18, 92 yards, 2 1sts, 2 TD, 1 interception. Kickoff returns—Antonio Ramirez 2-22; Alex Carrasco 1-19. Tackles (68)—Scott Harris 11, Fabien Munoz 7, Bryan Baker 7, Derek Mascorro 7, Jason Rebollozo 6, Jordan Jones 6, Jackson Kunz 6, Jason Konrad 5, Antonio Ramirez 3, Morgan McCracken 2, Alex Carrasco 2, Carygan Harris 1, Drew Bailey 1, Zack Yoshida 1, Jake Mills 1, Branson Handy 1, Tyson Greener 1. Note: Haylee Thompson has a 29-yard field goal. Touchdown passes—Kevin Jensen 2, Connor Braatz 1. Conversion passes—0. Notes—Wood River has scored in 13 of 28 quarters....Wood River has successfully made 12 of 14 conversions (86% success rate)....Wood River has scored 14 TD—9 on runs from scrimmage, 3 on passes, 1 on kickoff or punt returns, 1 on defense.